MSRRF fitness and therapy team leader Deborah Davidson (left) and fundraising manager Dan Nelson (centre) with representatives of the UNW Charity and Communities Support Group (right). Picture by The Bigger Picture Agency. An accountancy firm has selected its charity of the year. 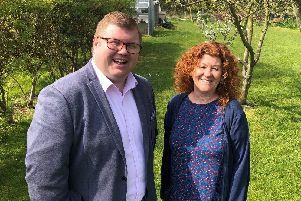 Chartered accountancy and business advisory firm UNW has selected MS Research and Relief Fund (MSRRF) as its charity for 2018/19. Based in Morpeth with nine outreach centres across the north east, MSRRF supports people affected by multiple sclerosis (MS) and their families and friends. MS is a chronic, progressive disease affecting the nerve cells in the brain and spinal cord. People commonly experience severe fatigue, numbness and impairment of muscle co-ordination and speech. Newcastle-based UNW regularly raises funds for wide variety of organisations, with recent beneficiaries including Charlie Bear for Cancer Appeal, Caring Hands and Newcastle Women’s Aid. The new partnership with MSRRF follows on from a successful two years with Gosforth-based children’s charity Smile for Life, for which UNW raised more than £20,000. Andrew Wilson, UNW managing partner, said: “We’re delighted that MS Research and Relief Fund has been chosen by colleagues as UNW’s new charity of the year for 2018. Dan Nelson, fundraising manager at MS Research and Relief Fund, said “Everyone at MS Research and Relief Fund is delighted that UNW has chosen us to be its new Charity of the Year. “One of our major challenges is brand awareness in the north east so to be aligned with a leading north east business is massive for the charity. “The money and profile that UNW can raise for us will make a real difference to the quality of local people’s lives who are affected by MS.